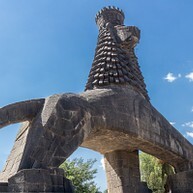 Although most visitors to Ethiopia enter the country through Addis, few choose to linger for more than just a night or two before heading further inland to explore some if the country's ancient relics, and very unjustly so. There is an urban vibrancy of a distinct kind inhabiting the busy Mercato and Piazza, scented by the aromas of excellent coffee served at nearly every corner, and a handful of worthy museums to check out on a longer stay. The capital's Ethnological Museum is considered to be one of the finest on the continent. Intricately arranged exhibits narrate the story of Ethiopia and its peoples, all spanning two floors of the former residence of Emperor Haile Selassie, whose rooms are preserved in nearly their original state and open to visitors. Detailed written explanations are provided. Although the National Museum contains a plethora of cultural artefacts, its most notable exhibit is the cast of Lucy, a female skeleton of the Australopithecus afarensis species, discovered in Ethiopia in 1974 and dating back as far as 3.2 million years. 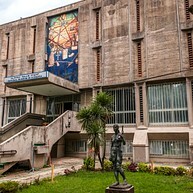 The museum also contains Ethiopian art from the 14th to the 20th centuries. The chilling, heartbreaking exhibits of the Red Terror Martyrs' Memorial Museum are guaranteed to leave no visitor indifferent. 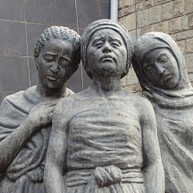 Atrocities commuted during Mengistu’s Derg regime are laid bare, to be processed independently or with an English-speaking guide. The museum operates on donations alone; entry is free of charge. 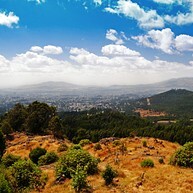 A steep climb (or car ride) up Entoto Hill is worth the time if only for the spectacular views over sprawling Addis Ababa unfolding from the top. On Sunday, the hilltop Maryam Church is open for mass (closed other days of the week), and the Entoto Maryam Museum showcases artefacts and personal belongings of Emperor Menelik, whose humble palace still stands not too far away. Typically octagonal, the stern-looking, neoclassical St George Cathedral was where Ethiopian rulers were inaugurated ever since its construction by the order of Emperor Menelik II, who dedicated the church to Ethiopia's patron saint, St George. Adjacent to the church is a museum containing religious paraphernalia. It takes heart to venture into the chaotic-looking, sprawling marketplace of Addis Ababa, but despite what it may seem at first glance, the market is very much organised, subdivided into "quarters" dedicated to a specific kind of wares. Come with a guide to help you navigate; many vendors keep goods inside permanent stalls, so what it is that is being sold might not be apparent at first glance. Items worth browsing for are leather goods, silver jewellery, spices, and more. 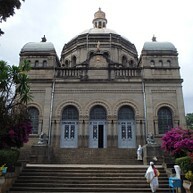 The second in importance house of worship in Ethiopia, the Holy Trinity Cathedral contains the tombs of Haile Selassie and his wife; many more prominent figures of the country's history are buried on its compounds. The building itself is a curious mix of international styles. The capital's atmospheric "old town" is known as the Piazza, its name gesturing towards the brief period of Italian presence in the country. The area still breathes an Italian air today, and there are a few landmarks remaining from the first half of the 20th century. 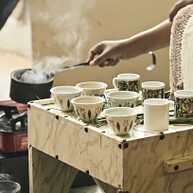 A few good places to eat and budget accommodation are also to be found here. 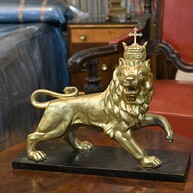 After being relocated back to Ethiopia from Rome in the 60s, the symbol of Ethiopian monarchy - the Lion of Judah - marks the beginning of Churchill Avenue, one of the city's main shopping streets, running from the railway stations straight into the popular Piazza neighbourhood. A hidden door inside leads into the crypt, where several Ethiopian royals are buried, along with Emperor Menelik himself. The marble tombs are a stunning discovery in themselves, but the real kicker is an original painting by Michelangelo also on display here. Come with a guide to get the full experience.